The Pistol Star is the bright white dot in the center of this image taken with the Near Infrared Camera and Multi-Object Spectrometer (NICMOS) on the Hubble Space Telescope. Credit: Don F. Figer (UCLA) and NASA. The Pistol Star is one of the most luminous and most massive stars known. It is about 10 million times brighter than the Sun and 100 times more massive. The Pistol Star lies at the center of the Pistol Nebula, which it created it by expelling up to 10 solar masses of gas in giant outbursts some 4,000 to 6,000 years ago. 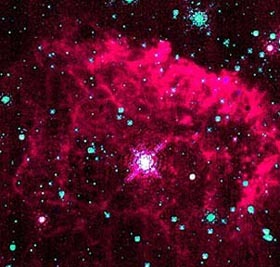 Both star and nebula are in the Quintuplet Cluster, close to the center of our galaxy, about 25,000 light-years away; yet despite this immense distance, the Pistol Star would be visible to the naked eye, as a fourth magnitude star, if it were not obscured by dust clouds in the plane of the Milky Way. The most powerful telescopes cannot see the Pistol Star at visible wavelengths; however, 10% of its infrared light reaches Earth, putting it within reach of infrared telescopes. Factoring in all the material the Pistol Star has shed in its brief lifetime, this extraordinary object may have started out with a mass of up to 200 solar masses – larger than the maximum stellar mass anticipated by contemporary theories of stellar evolution.